I grew up Syracuse Orangemen (now Orange) fan since I was 7yrs old. My first introduction to Syracuse was watching the 1987 National Championship game against Indiana. 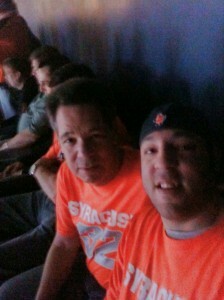 From that point forward I bled orange and remember most big games since that time. With my fandom in full force I dragged my dad into being part of my misery. I also converted him into a Broncos fan the same year and signed him up for even more suffering that would now last from September all way through March. Yes there is a theme of Orange and Blue for my favorite teams. It was the spring of 1996 when I got accepted to Umass and that March both Syracuse and Umass were in the Final Four. I was rooting for both teams but didn’t know who I would support in the title game if I had to pick. Unfortunately Umass lost to Kentucky and the Cuse wound up losing a close game to a Kentucky team that had 7 future NBA players on it (Can you name all the players without looking them up?). Than my freshmen year at Umass was the last time the Minutemen made the tournament and lost to a Larry Hughes St.Louis team. Since then there hasn’t been much Umass basketball to root for come March and I’ve remained a huge Syracuse fan through the years. With that being said this past season by the Orange was a huge treat for me to follow and dream of another Final Four run. Knowing that it could be a special season I thought it would be the perfect time for my pops and I to see our first ever NCAA Tournament game. So the wheels started spinning on getting myself from San Francisco to Buffalo where the Cuse was destined to be for their 1st and 2nd round games (I was solely basing this by Joe Lunardi’s projectios). Maybe next year Umass will finally get back in the tournament especially if it’s expanded to 96 teams, Go Umass!! This entry was posted in Alumni Posts on April 18, 2010 by cssr. On Friday evening, NBC will broadcast the Opening Ceremonies of the 2010 Olympic Winter Games. Together with Sunday’s Super Bowl it marks the second high profile sports telecast in a span of a week. In addition to their proximity on the calendar, these two events also share the distinction of having two of the largest female fan bases in the U.S. According to Simmons Consumer Research, 48.6 million women 18+ are fans of the Winter Olympics, while 35.3 million women are fans of the NFL (the only sport to boast more female fans is the Summer Olympics with 51.9 million). Nearly half of the Winter Olympics total fan base (49.4 %) in the U.S. is female, compared with 37.9 % of NFL fans. Nielsen reported that last year’s Super Bowl telecast averaged 38.3 million female viewers, the most for any TV program since 38.6 million women watched the 1994 Winter Olympics figure skating competition, and the third-largest female viewership since Nielsen starting tracking female viewership in 1991. Nielsen estimates that Sunday’s broadcast of Super Bowl XLIV boasted an average audience of 106.5 million U.S. viewers, meaning the broadcast likely attracted an average audience of more than 40 million female viewers. In contrast, last year’s Academy Awards averaged a total of 36.3 million viewers, an estimated 22 million of those being women. Research from Simmons also indicates that a large percentage of these two groups of female sports fans (a total of 25.2 million women or 22.1 % of all U.S. women 18+) consider themselves fans of both the NFL and Winter Olympics. So, who is this female sports fan who we presume will watch both of this week’s broadcasts? Well, she’s more likely to be between the ages of 35-44 (20.1 %, index of 110), white (83.1 %, 107) and a parent (58.3 %, index of 108). This female fan is also highly educated (she is 43 % more likely than a member of the general public to be a college graduate and 28 % more likely to have attended graduate school), more likely to be married (55.46 %) and more likely to have a household income over $100,000 (33.7 %, an index of 125). In terms of brand preference, this fan prefers Diet Coke to Diet Pepsi, is more likely to carry a Motorola than a Samsung phone, more likely to use Verizon or AT&T than Sprint and prefers Coors Light to Bud Light. So what else should marketers know about how to engage this group of more than 25 million women? This female fan likes commercials that make her laugh (80.0 % agree with statement, 120 index), always looks for special offers (72.9 %, 124 index), doesn’t mind brand name products in her favorite TV shows (60.7 %, 120 index) and often notices ads on billboards (62.1 %, 129 index). She is also more likely than a member of the general public to be drawn to stores she doesn’t shop by coupons (134 index), buy magazines (132), read a newspaper most days (123) and rely on the internet for information (123). Will marketers heed these suggestions to engage the female sports fan? Tune in Friday to find out. Our mission and goal is to make brands a more meaningful part of people’s lives. As experts in brand consulting, sponsorships, lifestyle and experiential marketing, we use relevant insights to create real connections with people where they live, work and play. We are a part of the Publicis Groupe family and we serve a diverse roster of brands including Coca-Cola, Walgreens, PayPal, Sharp Electronics, Kashi and Beam Global Spirits & Wine. This entry was posted in Uncategorized on February 10, 2010 by . Over winter break, I had the opportunity to go to India with the Business School to study Indian business and culture. While in Chennai and Madurai, we were able to visit the Chennai Open, the tennis tour event, and take part in some Indian sporting culture by playing cricket and kabbadi. As someone interested in the NBA, it was noticeable how absent basketball was. Besides a random Bobcats-Knicks game on TV and two courts (with no one on them), there was no basketball to be found. As the NBA begins to promote the game in India, it will be interesting to see how well it catches on with the general public. The NBA has already launched an NBA India web site, to help promote the game there and plans to open an office in the future. Will the NBA be successful in India? There are reasons to be optimistic. With India’s economy growing, the culture of India has been changing. The younger generation is more urban and western in culture. This generation is breaking from the traditions of the older generations, such as arraigned marriages and clothing options. This generation also has higher incomes, due to many countries looking to India for talent and customers. With this growing income will come a larger piece of entertainment spending. If the NBA positions itself correctly, it can capture some of this new market. India already has a large sports spectator base with cricket. Cricket is by far the most popular sport in India. In 2008, the Indian Premier League was established, based on the Twenty20 style of cricket. This league has been very popular, since it condenses a cricket game, which previously could take days, into a few hours. The question is which sport will become number two? The NBA’s biggest competitor in this would seem to be soccer. As noted in Slam Magazine, The English Premier League has started to gather momentum in India, along with other top European leagues. In my time there, a number of stores were filled with international soccer jerseys. The key to which sport becomes number two may be which sport produces the first Indian star. Two markets similar to India for basketball would be China and Brazil. China is similar due to the large number of people and the growing economy, allowing a new middle class to afford to watch and play the game. Brazil is similar in that one sport was dominant (soccer) and basketball was able to gain a foothold as a strong secondary sport. However, both China and Brazil had something India does not have yet: a national star. In China, that is Yao Ming, whose jump to the NBA has made the China market much more accessible and has prompted much growth in basketball participation among youths. In Brazil, the star was Oscar Schmidt. His playing years in the 80’s and 90’s made Brazil a strong international team, and led many youths to play including Nene Hilario and Leandro Barbosa. Therefore, the key to the NBA’s success may be to cultivate a strong playing culture, in order to produce a star that will attract the Indian audience. Next week, I will look at the New Jersey Nets marketing campaign for the year. This entry was posted in Uncategorized on February 6, 2010 by . In this ongoing environment of economic uncertainty, many companies are reviewing their sponsorship investments as part of an overall audit of marketing spending. However, the current business landscape also presents a new opportunity to work with partners to evaluate key sponsorship provisions, fine tune existing portfolios and ensure that any new sponsorship investments work hard to meet business objectives. Gone are the days when properties can insist on multi-year commitments in order to attract sponsors into the fold. The recent announcement that Papa John’s has signed a short-term partnership with the National Football League to serve as the “Official Pizza Sponsor” of Super Bowl XLIV is yet another example of sponsors having the flexibility to leverage national properties during shorter promotional windows. Over the past two years the NFL has inked similar partnerships with KFC, IHOP and McDonald’s, who will be the Presenting Sponsor of this year’s Pro Bowl, demonstrating that even heavyweights like the NFL are more willing than ever to be flexible. While you’re at it, negotiate in the flexibility to modify contractual elements that may not be working as hard as you expected. Ask yourself if paying for exclusivity is really necessary. While exclusivity does have a critical value in some product categories where it’s an important element for selling in programs to retailers or other channel partners, many brands continue paying a premium for exclusivity when that status has declining value in a cluttered sponsorship world. Make sure you are clear about the role of exclusivity in making your sponsorships perform. Fans need reasons to spend their limited disposable income on your product or service, and one of the best ways to explain those reasons is through a meaningful one-on-one interaction. Work with properties to repurpose passive sponsorship elements (e.g. program ads or concourse signage) into ways that your brand can have a real, person-to-person conversation with fans about your product or offering. Many properties have historically made annual price “escalators” a standard element in sponsorship agreements. These automatic increases assume sponsorship value goes up each year regardless of any other factors (attendance, your sales, the economy, etc). Brands should be wary of such clauses, especially if these increases aren’t tied to specific performance metrics being met by the property. Similarly, the old policy of charging additional fees for post-season rights should also be resisted. Remember, the balance of power is now with the brands, so demand that properties be accountable for both program execution and property performance along key metrics such as attendance, brand interactions, TV ratings and web traffic. This entry was posted in Uncategorized on February 5, 2010 by . An NBA Team in Las Vegas? In Vegas, I got into a long argument with the man at the roulette wheel over what I considered to be an odd number. It’s been a while. Between finals, winter break and a trip, I have not been keeping up with the blog like I should have. However, with a new semester, I am energized to begin again. I will start with the topic I planned to discuss last time, an NBA team in Las Vegas, especially in light of recent stories pertaining to this. Of the four major North American sport leagues, the only one that has even seemed to entertain putting a team is Las Vegas is the NBA. The NBA has owners who are active in Las Vegas (the Maloof brothers, who own the Palms resort and casino and the Sacramento Kings) and hosted their All-Star Weekend in Las Vegas in 2007. However, the main obstruction to putting a team in Las Vegas has always been gambling. The perception would be, if a team is in Vegas, it will be influenced by gambling and lead to fixed games. Three recent stories have reemphasized the NBA’s concern with its association with gambling. First, which I discussed in my last post, was Tim Donaghy publishing his book detailing his gambling on NBA games. The second story involved a Kings scout who was banned from the NBA for betting on league games, including Sacramento games. And finally, the Gilbert Arenas story, in which he brought guns to the locker after a dispute, originated from gambling on a card game on the team plane. However, as the above three examples show, gambling is everywhere. Especially in this age of instant communication, it is naïve to think that gambling cannot reach outside Las Vegas. It is understandable that the NBA would be hesitant to attach a team to a city noted for gambling, especially in the wake of the Donaghy scandal and the concern of refs “rigging” games. However, the average sports fan should be sophisticated enough to separate the gambling from the game. Therefore, the NBA should not allow that to hold them back to putting a franchise in Las Vegas. At this point, the discussion of whether to put a team in Vegas should be the recession. Las Vegas was hit particularly hard by the current economic setback. Prior to it, Las Vegas was one of the fastest growing cities in the country. Now, it will be interesting to see how Las Vegas responds to this recession. Its response may determine whether a team will be put there, not just for the NBA, but any sport. The market there is devoid of any major league sports, so the first team that enters there is likely to capture a large piece of the entertainment market. That, along with the number of tourists coming through, would make a sports team a good investment for a sport league willing to take a chance. Next week, I will look at the NBA’s opening an office in India, and whether the NBA can crack into the Indian market. This entry was posted in Uncategorized on January 28, 2010 by . Time for NFL to Embrace European System? Promotion and relegation? Do most American sports fans even know what that means? Unless you are a fan of soccer, football, futbol, or whatever you choose to call it, which many Americans are not, you do not know these terms. I recently spent a few weeks over in Western Europe, mainly in the UK and got into some interesting debates about the American sport system versus the European sport system. My good friend Peter, or “Petah” as Peter as I say it sounds way to American, is a former grad student at UMass who was known for discussing/arguing things as trivial as which oil was best for frying fish. But of course, as Sport Masters students, are debates centered around that subject. While staying in the UK with “Petah”, I had the opportunity to see a Manchester United game at Birmingham City, which was a miracle considering all but two games of the premier league were cancelled that weekend due to inclement weather. I’ll tell you one thing, England absolutely shuts down for a few inches of snow. Leading up to the game, I had a lively debate with “Petah” about why American sports, particularly American football, should embrace the idea of promotion and relegation. For those who don’t know, the European system is built around clubs. Anyone with the resources can start a soccer team, which starts out in low level leagues, but then has the ability to move up into better leagues based on success. So for example, in the Premier League (highest league in England), the bottom 3 teams every season move down to the Championship (2nd highest league) and the top 3 teams from the Championship move up to the Premier league. This is done to keep competition up and not allow teams and owners to sit back on their laurels and collect huge paydays. I always argued with “Petah” that this system would never work in the United States, for a few reasons. Looking at the top 3 sports in America (Football, Baseball, Basketball), we have the highest standards in the world for each of those sports (granted they are mainly American sports, with the exception of basketball). Teams cannot survive without fan attendance, and people will not pay to see lower quality sports, just because they have a team. Take for example the new USFL that started this past year. This league had a large number of talented players in its ranks but attendance was almost laughable. People want to see the NFL, NBA, and MLB, period. Secondly, we already have a second tier development system for our most popular sports, it’s called the NCAA. Now I realize that this is “amateur” at least depending on who you ask, but college football and basketball are arguably more popular than their counterparts. To create the idea of promotion and relegation at least within American football, you would have to allow players to play after graduating high school, which will not happen for several reasons. At the end of the day, these leagues have create a natural monopoly. The best athletes want to play there, and other leagues simply cannot match what the NFL, NBA, and MLB have done. While I disagree that the promotion and relegation system could work in the US, it is interesting to look at some of the things it brings to the table. Take the NFL for example, which has huge revenue sharing deals as a league. While the NFL is the king of parity, due to its strict salary cap restrictions, NFL owners do not have much incentive to spend. Teams can basically sit back and regardless of success, collect huge profits, due to revenue sharing. While most owners want to win, we have seen teams less preoccupied with winning and more preoccupied with the bottom line. Maybe a little competition is what the NFL needs. If teams were threatened with being demoted to a second tier league, with less financial resources and less prestige, maybe that would be a good thing. Having said that, it won’t happen anytime soon. After a nice long winter break, the UMASS Sports Biz Blog is back at the start of the new semester. This term, we will have a wide variety of discussion topics, including the Olympics which are coming up in a few weeks, the American Needle v. NFL case and its effect on the world of sports, and many more. If any of you out there are interested in writing for the blog, please contact the administrator. Hope to have some great conversations over the next few months. This entry was posted in Uncategorized on January 26, 2010 by . Once again, the Tim Donaghy scandal is back in the news, due to two impending book deals. First, Tim Donaghy has written a tell-all book about his experiences. Previously, the book was shelved, with Random House getting pressure from the NBA not to release the book. However, a new publishing company, VTi-Group out of Tampa, has stepped in and plans to release the book by this Christmas. Another book is planned to be released, written by the man in charge of the gambling operation, Jimmy “The Sheep” Battista. His main contention in the book is that there were 13 NBA referees in on the scandal, including a “big five” who fixed games. According to the sources in the linked article, Battista has phone records and various notes to back up his claims. The Tim Donaghy scandal began over two years ago when federal agents exposed him fixing NBA games for gamblers. The fact that the issue is still haunting the NBA shows both how big a deal it is and how poorly the NBA dealt with it when it first arose. Although the NBA conducted an internal investigation, in which they concluded that Tim Donaghy worked alone and that it was an isolated incident, they have otherwise tried to suppress any discussion of the issue. The fact the NBA never published its investigation, though, just feeds the perception that the NBA is covering up a larger issue. The analysis of other referees is possible, as shown by Wayne Winston in his book Mathletics. In it, he showed how Donaghy’s games usually had a significantly higher number of fouls called, which would create higher scoring games, affecting over/under lines for gamblers. As Winston states at the end of his chapter on the issue, his data looks only at refereeing groups, whereas the NBA has data on individual referees, and should be able to easily show whether referees had statistically different results in the games they officiated. Whether the NBA or Donaghy and Battista are correct is beyond the issue at this point. The NBA has an image problem that it is a rigged league, and its actions since the Donaghy scandal have only fed into that perception. By not publishing its findings, pressuring publishers to not release Donaghy’s book, and generally trying to sweep the whole episode under the rug, the NBA acts like it is hiding something. If the NBA confronted the issue at the onset, it could have dealt with it and moved on. Instead, by allowing the problem to fester, the NBA will not only have to deal with Donaghy, but possible fan backlash in the future. Next week, in the same line as gambling, I will look at the chances of an NBA franchise ever going to Las Vegas, a topic discussed as teams may be eyeing relocation. This entry was posted in Uncategorized on December 4, 2009 by . I’ve been writing about sports and non-profits teaming up to make a different and this week provides one of the greatest examples of that. December 2nd – December 8th is Jimmy V week on ESPN. Like many non-profits the V Foundation started off extremely small and on a shoestring budget. It was Jimmy’s closest friends, family and ESPN that helped initiate the major impact it has had on cancer research over the last 15 years. The foundation has continued Jimmy V’s vision by running the organization with true passion and dedication that he started it with. In past articles I’ve talked about the difficulties athletes face when starting their own non-profits. They can all look to the V foundation for how to get organized and generate the support needed to run a successful non-profit. One individual can make a huge difference by spreading their passion and than others will join the fight. No matter what type of non-profit you choose to support we can all make a difference. However you lend your support goes a long way to spreading the idea of philanthropy and helping others. I hope my up-coming posts will get you in the mood to give back this holiday season. This entry was posted in Uncategorized on December 3, 2009 by cssr. Last week, I looked at the decline in NBA attendance due to the recession, and the impact on revenue. To counteract this loss, teams have implemented some new sales strategies to increase attendance and revenue. One tactic is variable pricing. Similar to the airlines changing seat pricing based on the demand for the flight, teams have begun using variable pricing to charge different prices for seats, depending on the visiting team. Top teams get premium prices and lesser teams get lower prices. This way, the teams are able to take advantage financially when top teams come to town, and to fill seats when worse teams play. Some MLB teams have used variable pricing for a while, but so far only three NBA teams employ it: Utah, Portland and Miami. Although there has not been a study to see whether this has actually increased revenue in sports, theoretically, in MLB, it is predicted to add about $590,000 to yearly revenue. Another tactic is ticket partnering, where season ticket holders can share a package of tickets for the same seats. Initially, teams were reluctant because they felt they would lose money (because two potential fans would be sharing one seat, instead of taking up two seats). However, with the recession, teams see this as a way retain fans who may not be able to afford a full season package this year. One specific strategy, implemented by the Sacramento Kings, was to work with the local government and businesses to sell tickets. Called “Operation Sellout”, the Kings involved the local community to sell tickets and promote the businesses. It succeeded in selling out the first game, although subsequent games returned to the normal lower attendance. This strategy, though, creates a closer bond to the city, which may lead to more involvement in the future. These ticket strategies show the importance of the present, to cover immediate losses, and the future, to be able to grow the business when the economy recovers. For teams to be successful, they will need to take both into account. Next week, I plan to write about the aftermath of the Tim Donaghy scandal and how the NBA will deal with it. This entry was posted in Uncategorized on November 27, 2009 by .